We go back to the ring and Paige introduced as the special guest commentator for this match. She joins Cole and Renee. WWE Women’s Tag Team Champions Sasha Banks and Bayley are out first. Nia Jax and Tamina Snuka are out next. Out next are The IIconics, Peyton Royce and Billie Kay. WWE Hall of Famer Beth Phoenix is out last with her partner Natalya. They also get a pop of fireworks. Snuka starts off with Bayley and works her over. Snuka stops and starts knocking people from the other teams off the apron to the floor. All teams are in the ring, Nia slams Beth to the match before Sasha and Bayley double team her. Phoenix and Natalya end up driving Jax into the steel ring steps on the floor. Royce is legal with Bayley now. Banks tags in with the double team on Royce. Royce counters double knees and rolls her up. Peyton keeps control and covers Banks for a 2 count. Kay comes in for the double team on Banks. The IIconics do their signature pose for a pop. Banks rolls Kay up for a 2 count. Kay tags in Royce and then knocks Bayley off the apron. Banks gets double teamed again. Royce with a 2 count. Banks with another 1 count on Royce. Banks and Bayley double team Royce now. Peyton and Kay take turns on Phoenix now. Beth kicks out after Royce drops her. Kay tags back in but Beth blocks their double suplex and hits one of her own. Beth holds Kay as Natalya comes in and they hit the Hart Attack as a tribute to The Hart Foundation. Banks tags in and Natalya takes her right down. Banks and Bayley tangle with Natalya and Phoenix now. The champs get the upperhand on Beth and Banks drops her into a Banks Statement in the middle of the ring. Phoenix powers up and goes for a Glam Slam but Banks blocks it. Natalya tags in and goes for a Sharpshooter on Banks but Bayley runs in. Natalya drops her. Natalya slams them and applies a double Sharpshooter at the same time. Snuka runs in and superkicks Natalya to break it. Phoenix runs in and nails Snuka. Jax and Snuka come in and clean house now. They double team Beth with a headbutt. The IIconics attack but they get hit with double Samoan Drops. Jax and Snuka continue to dominate. Jax and Snuka climb to the corners while the champions are down. They go for double Superfly splashes on the champs but Phoenix pushes Jax to the floor from up high. Snuka steps down and runs over but Natalya and Beth drop her at the same time. Banks with knees from the apron to Beth and Natalya on the floor. Banks brings Natalya in the ring and Bayley tags in for the big flying elbow drop. Banks goes to the top rope and hits a Frogsplash to Natalya for a close 2 count. Banks unloads on Natalya in the corner now. Bayley and Sasha double team Natalya in the corner, taking her to the top for a double superplex. It’s broken up. Bayley and Phoenix tangle up high. Phoenix goes for a huge super Glam Slam from up high and she hits it but The IIconics steal the pin as Key pins Bayley for the titles. 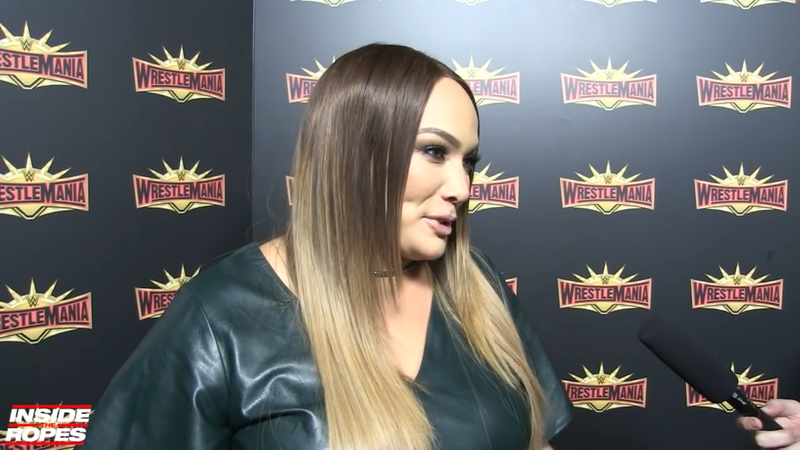 As part of Wrestlemania Week Inside The Ropes Attended the Connor’s Cure Superstar Reveal, where heroic kids created their own superstar entrances, following the event we had the chance to speak to “The Irresistible Force” Nia Jax about knocking out Becky Lynch before Survivor Series, her exciting Royal Rumble appearance and Nia reveals why her scheduled intergender match with Dean Ambrose didn’t take place. Natalya w/ Beth Phoenix vs Sasha Banks w/ Bayley ended in a no contest after Nia Jax and Tamina came out to attack Beth, Bayley and Sasha. 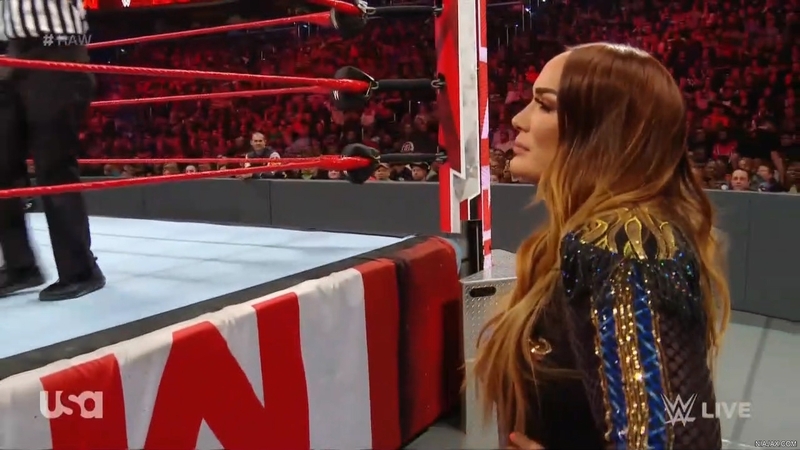 Nia Jax is on the ramp. Nia claims Beth is jealous of her and that in the last three years, she’s already achieved more than Beth ever. The distraction allowed Tamina sneak ringside, flooring everyone with super kicks until Natalya chased her off. Nia then signed off by saying that she will see them all at WrestleMania. Lacey Evans begin to exit the arena when Nia’s music hits and out comes Nia and Tamina. 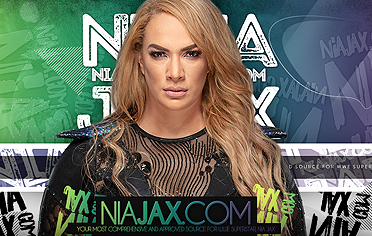 Nia and Tamina have a stare off with Lacey. Natalya is out next with Beth Phoenix. Natalya charges in on Nia throwing kicks and forearms. Natalya hit the ropes and Jax takes her out with a lariat. Nia tosses Natalya across the ring before charging into the corner. Natalya with a boot to halt Nia but Tamina gets involved by grabbing Natalya’s leg, allowing Nia charge the corner with a body avalanche. Beth Phoenix gets frustrated slides in the ring and attack Jax. Beth with a lou thesz press into punches to Jax, Tamina runs in and Beth takes her down too and tends to Natalya as Nia and Tamina head to the back. 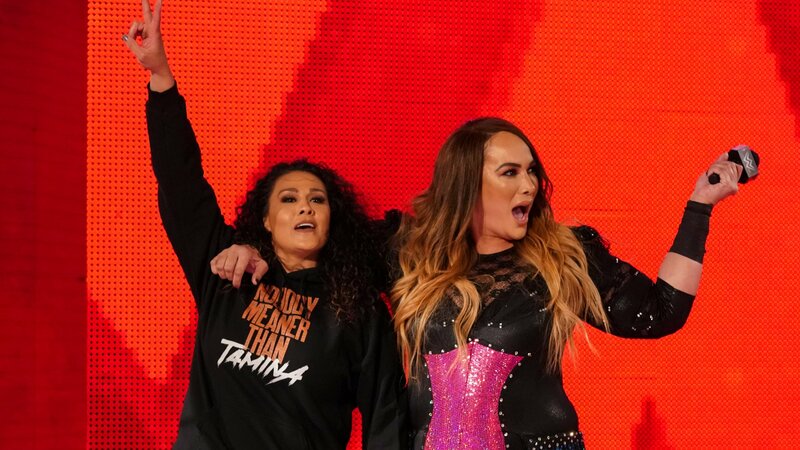 We go backstage where Nia and Tamina are being attacked by Boss and Hug Connection, referees and road agents pulling them apart as they continue to brawl with each other. We go to the ring and WWE Hall of Famer Beth Phoenix is introduced as the guest commentator for this match. She joins Cole, Graves and Young at ringside. Out first are WWE Women’s Tag Team Champions Sasha Banks and Bayley for their first title defense. They head to the ring together after Banks comes out first. 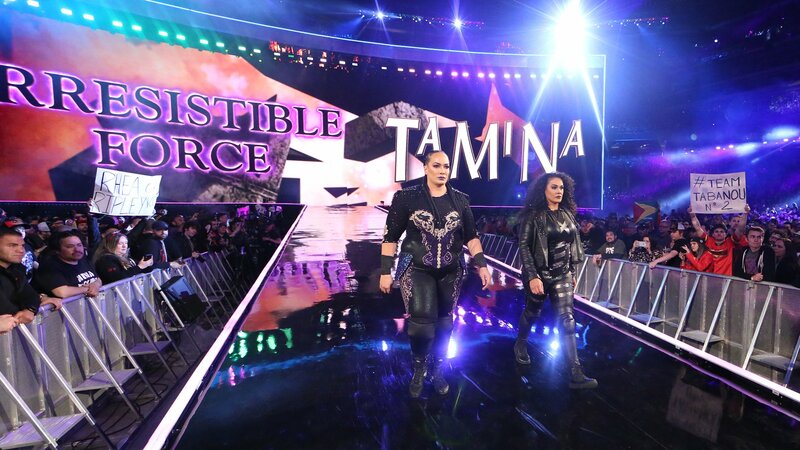 Tamina Snuka is out first for her team. 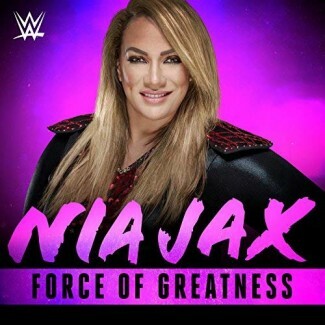 She waits on the stage and out next comes Nia Jax. They head to the ring together. We get formal ring introductions from Rome. Bayley starts off with Snuka. Bayley gets sent to the corner but she fights out. Banks tags in and they turn it around. Jax tags in and they try to keep momentum going with frequent tags but Jax tosses one into the other to take control. Jax unloads on Bayley now. Snuka comes in for the double team on Bayley. Snuka with a 2 count. Snuka with more shots in the corner now. Jax tags back in and fights Bayley off. Snuka with another tag. Jax and Snuka continue to make frequent tags. Jax powerbombs Bayley and Snuka covers for a close 2 count. The referee checks on Bayley while she’s down. Snuka keeps her grounded in the middle of the ring now. Banks finally gets a tag and she goes to work on Snuka. More back and forth between the two. Banks rocks Jax on the apron. Jax tags in for the double team Samoan Drop but they botch it. Jax recovers and hits the Samoan Drop on Banks but Bayley breaks the pin up. Jax misses a splash in the corner. Bayley tags in and unloads on Jax in the corner. Snuka runs in but Bayley sends her out to the floor. Jax tries to stop Bayley’s momentum. Snuka gets sent into the ring post, then Jax does. Banks tags in and hits the Meteora from the top to Jax. Banks and Bayley with another double team with Banks going to the floor. Bayley runs the ropes and nails a dive, taking down Banks, Jax and Snuka on the floor. The referee counts. Banks and Bayley push Jax back into the ring. Banks goes to the top for the double knees. Bayley follows up with the top rope elbow drop but Snuka breaks the pin up. Banks runs over to stop Snuka but Snuka drops her on the floor. Bayley drops Snuka over the middle rope. Jax grabs Bayley for a powerbomb but it’s countered with a pin attempt to retain the titles. After the match, Jax and Snuka immediately attack the champions. They toss them out of the ring to the floor. Snuka knocks Bayley back with a superkick to the face. Jax launches Banks over one of the announce tables. Jax and Snuka stand tall as fans boo them. Phoenix backs up and turns around to Snuka staring her down. They have words as fans cheer. Phoenix drops Snuka with a forearm. Jax comes from behind and drops Phoenix. Jax and Snuka double team Phoenix. Jax brings Phoenix into the ring and runs the ropes for a big leg drop in the middle of the ring. Snuka goes to the top for a splash on Phoenix but Natalya runs down to make the save for her longtime friend. The double team catches up as Natalya gets beat down as well. Officials hit the ring to get Snuka and Jax out. Phoenix and Natalya are down as referees check on them. Fans boo as Jax and Snuka back up the ramp with smiles on their faces. We go to replays. Jax and Snuka stare at the ring from the stage as Phoenix and Natalya recover. We go to a break. 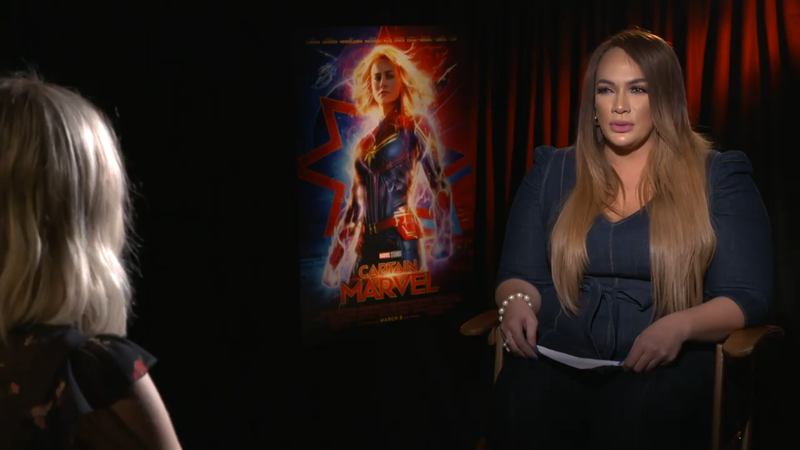 Nia Jax sits down with “Captain Marvel” star Brie Larson to talk about her training regimen, detecting Skrulls in the WWE Women’s locker room and the possibility of going one-on-one with The Irresistible Force in a WWE match.